Immigrants and allies are walking 65 miles from Grand Rapids to Lansing in a historic pilgrimage to demand licenses for all in Michigan. What does it mean to drive without fear? For 10 years, immigrants in Michigan have not been able to obtain driver’s licenses. Every day, we live with the fear of being detained while driving to work, to school, and to buy food for our families. Enough is enough—we’re tired of being afraid. To end our pilgrimage, immigrants and allies from all over Michigan will come together at the state capitol in Lansing to demand licenses for all immigrants. How can you get involved with our fight for licenses? Movimiento Cosecha believes it’s time for immigrants to fight for themselves. We are uniting the immigrant community to show the state of Michigan that we can no longer live with the fear and uncertainty of not having a licenses. We need you to help us win! For 5 days, we are walking on foot from Grand Rapids to Lansing so that the whole state will have to pay attention to our fight. Register now to walk with us for a few miles or the whole pilgrimage. Every day of the pilgrimage, we’ll be sharing our experience and stories on Facebook. Please follow the Movimiento Cosecha GR Facebook page to stay up to date with our walk. Our pilgrimage arrives in Lansing on Tuesday, October 9. At 1:00 pm, we’ll be rallying at the Capitol to demand licenses for all. Join us to support all immigrants in Michigan! Movimiento Cosecha is a national movement fighting for permanent protection, dignity, and respect for all undocumented immigrants in the United States. Cosecha organizers in New Jersey and Massachusetts have already joined the #LicensesForAll fight. Now it’s our turn! A “pilgrimage” of undocumented immigrants walking on foot from Grand Rapids will arrive in Lansing Tuesday afternoon to demand licenses for all in Michigan. They will be greeted by immigrants from throughout the state, community leaders, and local organizations for a rally. Hundreds of immigrants and allies are expected to attend a rally on Tuesday afternoon in support of driver’s licenses for all. Since 2007, undocumented immigrants in Michigan have not been able to obtain or renew licenses. Many immigrants who need to drive to get to work or pick up live with the daily fear that they may be stopped by police for any reason, detained for driving without a license, and possibly deported and permanently separated from their families. The pilgrimage began last Friday in Grand Rapids and passed through Lowell, Ionia, and Grand Ledge before concluding in Lansing today. Walkers include undocumented immigrants, allies, mothers, children, families, community leaders from Sturgis, Grand Rapids and Kalamazoo, and members of the Bronson Park Freedom Encampment. Walkers have been sheltered in local churches and fed by community donations since Friday night. Today in Lansing, immigrant groups and allies from Lansing and across the state will greet the walkers as they finish their pilgrimage and rally together for licenses for all. “This walk has been very physically challenging,” said Nelly Fuentes, a volunteer organizer with Movimiento Cosecha Kzoo. “We’ve been getting blisters, sleeping in churches, and struggling to keep dry in the rain. I have lived in Michigan for almost 20 years and I’ve never done anything like this before. For me, this weekend is marking the beginning of something new for immigrants in Michigan. It means we are coming together to fight for ourselves and our family in a way that has never happened before,” said Nelly Fuentes, a volunteer organizer with Movimiento Cosecha Kzoo. 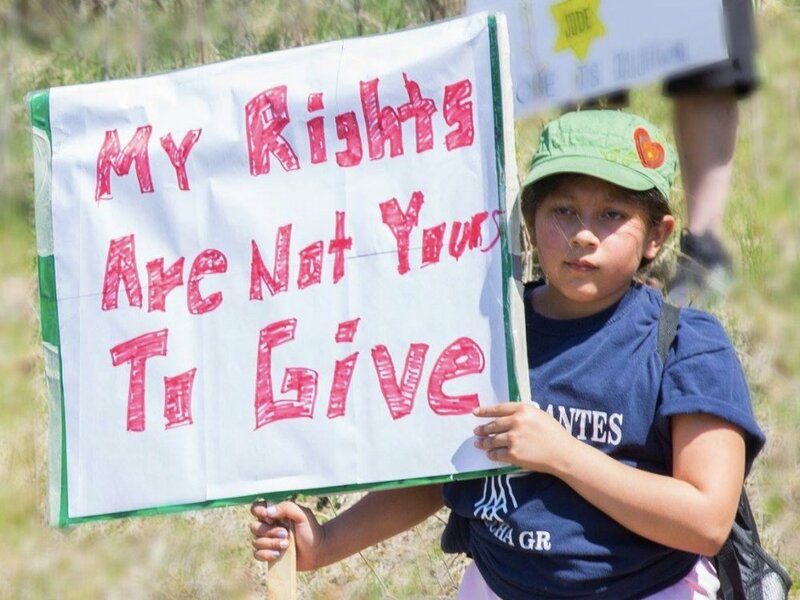 The pilgrimage and rally and part of a statewide “Licenses for All” campaign is led by Cosecha Michigan, immigrants, allies, and other local organizations. Photos and interviews with walkers and organizers available upon request. Movimiento Cosecha is a national movement fighting for permanent protection, dignity and respect for all 11 million undocumented immigrants in the United States. Cosecha Michigan is currently leading a campaign to mobilize the immigrant community to fight for driver’s licenses for all in Michigan. More information available at CosechaMichigan.com. Walkers to include Movimiento Cosecha GR and Movimiento Cosecha Kzoo; members of the Bronson Park Freedom Encampment; and Kalamazoo Commissioner Shannon Sykes-Nehring. Grand Rapids, MI - This Friday, October 5, a group of more than 50 immigrants and allies from Grand Rapids and Kalamazoo will begin a 60-mile, 5-day historic pilgrimage from Grand Rapids to Lansing. The walk concludes with a rally at the Capitol in Lansing on Tuesday, October 9 at 1:00 p.m. Participants will walk an average of 12 miles a day, rain or shine, with the goal of drawing statewide attention to the need for driver's licenses for undocumented immigrants. According to organizers, walking 60 miles on foot is a public sacrifice that symbolizes the daily experience of an undocumented immigrant in Michigan. For more than 10 years, undocumented immigrants have been unable to obtain or renew a driver’s license, forcing thousands to drive with the fear that that may be stopped by police, detained for not having a license, and even deported and permanently separated from their families. “This walk is going to be very physically challenging. We’ll be getting blisters, sleeping in churches, and struggling to keep dry in the rain. I have lived in Michigan for almost 20 years and I’ve never done anything like this before. But immigrant families like mine already make sacrifices every day to put food on the table, to support our children, to survive...this weekend, when my son and I sacrifice, we are making a choice. I am doing it for myself, for my family, and all immigrants in Michigan,” said Nelly Fuentes, a volunteer organizer with Movimiento Cosecha Kzoo. The pilgrimage begins at 7:00 pm at Rosa Parks Circle in Grand Rapids this Friday and will pass through Lowell, Ionia, and Grand Ledge, ending on Tuesday in Lansing. Walkers include undocumented immigrants, allies, mothers, children, families, community leaders from Sturgis, Grand Rapids and Kalamazoo. From Kalamazoo, more than a dozen members of the Bronson Park Freedom Encampment will be walking in the pilgrimage alongside Movimiento Cosecha Kzoo. They will be joined by Kalamazoo Commissioner Shannon Sykes-Nehring and her family. “I am walking to support drivers licenses for undocumented members of our community and also to support the Bronson Park Freedom Encampment. One of the things I love about this is that both groups are walking in solidarity. Cosecha has been a great support to the Bronson Freedom Encampment so now the encampment joins Cosecha. It is beautiful to see folks building solidarity,” said Skyes-Nehring in a statement. The pilgrimage is a part of a statewide “Licenses for All” campaign led by Cosecha Michigan, immigrants, allies, and other local organizations. To join, you can follow our pilgrimage this weekend on Facebook (Movement Cosecha GR and Movimiento Cosecha Kzoo) or at CosechaMichigan.com. The pilgrimage concludes on Tuesday, October 9 at 1pm at the capitol in Lansing with a Licenses for All rally. Photos and interviews with walkers available upon request. Movimiento Cosecha is a national, decentralized movement fighting for permanent protection, dignity and respect for all 11 million undocumented immigrants in the United States. For more information, visit lahuelga.com and cosechamichigan.com. Kalamazoo Commissioner Shannon Sykes-Nehring stands in solidarity with the Bronson Park Freedom Encampment and Movimiento Cosecha.